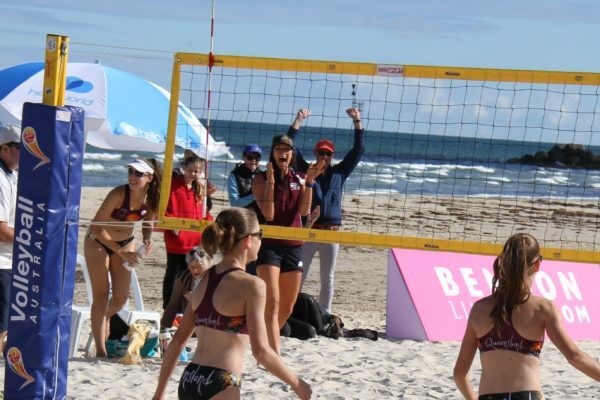 The GCAS Beach Volleyball program exists to provide additional support and development opportunities to aspiring young male and female Volleyball athletes of the Gold Coast region who have applied to be part of the program. These applicants are then overseen by the Gold Coast regional development staff. Athletes will be invited to participate in a high performance development program incorporating both practical skills and personal development. This Program is aimed at providing additional benefits outside of normal club and association trainings. The focus of training will be on individual fundamental skill development, team dynamics, winning strategies and basic fitness. In addition to the skills, team development and fitness training there will be core educational sessions for the athletes to help themselves prepare off the field and grow on a personal level. Beach Volleyball has been added to the Commonwealth Games program and is a NCAA sport in the US. Beginners are welcome to come and discover this sport with us. The program will run from February to November with regular squad training sessions focused on individual skill development as well as teamwork. In addition to on-field training sessions and competition opportunities, athletes receive access to educational seminars to assist with their personal development off the playing field. All athletes are asked to complete the application form for the 2017 GCAS Beach Volleyball Program. The program welcomes beginners along with experienced players. Beach Volleyball is a growing sport with inclusion on the Commonwealth Games program. After being selected the athlete must complete the participation and medical form and pay the specified levy. All forms will be made available to the players. Successful athletes to be announced via email on Tuesday 24th January 2017 via email and on our website and Facebook pages. GCAS football scholarship athletes must apply and be accepted by the regional development staff. All athletes who apply will be assessed and formally informed of the scholarship inclusions, expectations and requirements. The aim of the GCAS Volleyball program is to bridge the gap and provide the further support and development for athletes from the junior representative ranks to progress into higher representation within the club or school regional competition. Any athletes wishing to learn more about Beach Volleyball. Aspiring to improve in the sport. A levy of $ 380.00 (incl. GST) is applicable to athletes which covers the full cost of participation in the program, which starts in February and runs through to November. The GCAS uniform will be at an additional cost. The uniform must be worn by athletes at GCAS training sessions. – Access to further educational opportunities provided by GCAS. – Access to attend educational seminars, presentations and special events through the GCAS. – Access to the GCAS vTeam online sports locker system for streamlined communication opportunities with coaches and ease of access to additional information and resources from the GCAS. Applications are now open for a program for the beginning of 2017.Click Here. Applications are currently closed. Please contact GCAS office for more details.